ABSTRACT: A stratigraphic section measured in the northern area of Monserrat Island, Baja California Sur, yielded abundant moderate to well-preserved benthic foraminifers, rare planktonic foraminifers, calcareous nannoplankton, and ostracods. Based on both planktonic microfossils, relative age situates the base of the section from the Uppermost Miocene to Lower Pliocene, while the top is Upper Zanclean (around 5.06-3.3 Ma). The abundant benthic foraminifer assemblage is characterized by small tests and a few dominant species, i.e. Bolivinella seminuda, Brizalina subadvena and Brizalina interjuncta. The foraminifers are characterized as low-oxygen-related biofacies; the absence of heavily calcified fauna suggests that oxygen concentration of the bottom water was <0.3 ml/L. 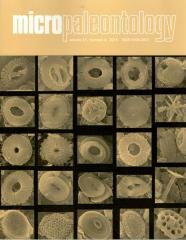 The presence of abundant pristine foraminiferal tests typical of an upper bathyal biofacies such as Planulina ornata, along with features considered as adaptations to low-oxygen conditions, suggest that the upper limit of the oxygen minimum zone was shallow, at a water depth of probably around 150m.